Lisa Dalton is the advertising manager. She started at the Nodaway News Leader on day 1, March 4, 1996. There are many duties that Lisa completes at the NNL. She creates marketing campaigns for clients, internet advertising, subscription data and also does the day-to-day bookkeeping duties for the company. She has been in the advertising field for over 30 years. Lisa was an advertising representative for the Penny Press before starting at the NNL. “I really enjoy my job here at the Nodaway News Leader. I have formed good friendships with a lot of my clients and have seen a lot of changes over the years. I feel very fortunate to love coming to work every day and I have the best group of clients and co-workers to spend my days with,” said Lisa. Lisa is a native of the Maryville area and now resides in Bedford, IA, with her husband of over 30 years. They have three grown children and eight grandchildren. In her spare time, she enjoys traveling and spending time with her grandchildren. 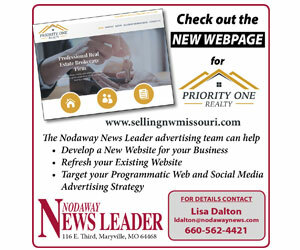 Contact Lisa: ldalton@nodawaynews.com, 660.562.4747 or 660.562.4421. Annette Mullins joins the NNL staff as the advertising designer, creating ads for our clients with a flare of creativity. She has worked more than 25 years at Rush Printing as a graphic designer and continues to work there in addition to the NNL. Originally from Iowa, she and her husband, Patrick, moved to the area in 1989 so Patrick could attend a horse shoeing class at Northwest Missouri State University. The couple currently resides in the West Nodaway school district on a small acreage and have three donkeys and honeybees. They have two children, Erin, a nurse, and Rachel, a student at Northwest. Mullins has served her community as a 4-H leader, a Girl Scout leader and she is a member of the Nodaway County Extension Council. In her spare time, she enjoys quilting and crafting. She actively sews with the Sewing Mission Group within her home church in Wilcox. The group makes quilts for the Children and Family Center, baby blankets for children in need along with other service projects. “Everyone here has been very welcoming. I like that it is a team effort to work on the same project,” Mullins said. Susan Randle joined the Nodaway News Leader in January 2018 as a customer service representative. She is a Nodaway County native and grew up west of Pickering. Susan graduated from North Nodaway High School and received a business and technology certificate from North Central Missouri College. Susan and her husband, Bob, have seven children and 15 grandchildren that keep them busy. In her spare time, she volunteers at St. Francis Hospital, likes to garden and do puzzles. Kathryn Rice joined the Nodaway News Leader in July 2013 as a reporter. A transplant who has lived in Maryville for 35 years, Rice now considers Maryville to be her hometown. She has a bachelor of science from the University of Central Missouri with a mass communications journalism degree. She brings 25 years of small business experience and community involvement to the NNL team. “I am thrilled to be a part of the NNL staff,” said Rice. “This opportunity to use my degree and get to know the people, places and events of Nodaway County is a wonderful utilization of my curiosity and zest for knowledge.” She is gathering and writing news articles; covering school boards, news and calendars; meetings and other activities of Nodaway County. She is always ready with her camera, as that is one of her many interests. Rice and her husband, Lewis, have three grown children and three grandchildren. In her spare time, she spends time with the grandchildren, her children and other family, snaps photos, rides motorcycles, reads, watches movies and is a member of the Maryville Pride Lions. She works the Northwest basketball concession stand as a Pride Lions fundraiser and admires the many local, national and international causes the Lions support. She is president of Local 26, Freedom of Road Riders, which is a motorcycle rights organization. In 2013, she rode over 6,000 miles on her motorcycle, which is her second highest yearly mileage total in the 18 years that she has been riding. She has a recommended second degree black belt in Hapkido. She considers the Maryville Spoofhounds, the Northwest Bearcats, the Kansas City Chiefs and the St. Joseph Mustangs baseball to be her teams and rejoices when they do well and commiserates when they don’t. Contact Kathryn: 660.562.4747, krice@nodawaynews.com or on twitter @Kathsmagic. MaryFran Stransky began working at the Nodaway News Leader in the spring of 1998 as the proofreader. When she moved to South Dakota in 2004, she continued to work for the paper remotely as the typist. Originally from Shenandoah, IA, she graduated from Hobart, OK, High School and received a bachelor of science degree in psychology/sociology from Southeastern Oklahoma State University in Durant, OK.
She and her husband, Tim, own the Maxam House Bed and Breakfast and B&B Tees at the Maxam House in Princeton, IN. They have two daughters. Erin is an executive for Royal Caribbean Cruise Line’s entertainment division based out of Miami, FL, and Megan is a kindergarten teacher in Princeton. When they are not hosting travelers at their bed and breakfast, the Stranskys spend their time traveling. Kay Wilson has had newspapering as her career field for all of her working life. The Nodaway County native began her career at Northwest Missouri State University on the Northwest Missourian staff as a reporter and then for four semesters as the campus newspaper’s advertising manager. After graduation with a bachelor of science in English-journalism, Wilson began work in 1977 at The Hopkins Journal, Nodaway County’s oldest weekly newspaper, as the advertising manager. She was also the editor and sales manager of a monthly trade journal, Hereford Highlights and as an advertising representative and advertising manager at the Penny Press Shopper. Leaving the shopper experience, Wilson began at the Maryville Daily Forum as the advertising manager and then publisher. Then in March 1996, she started a new weekly newspaper, Nodaway News Leader, which covers Nodaway County’s government entities and school news, including elementary and secondary levels, and currently has a subscription list of over 3,300. Wilson, along with her husband, Norman, live on the family farm near Pumpkin Center. They have raised two sons. Matt, who holds a doctorate from University of Washington, Seattle, was a visiting assistant professor in the Graduate School of Design, department of landscape architecture/urban planning and design at Harvard University, Boston, MA, for the 2013-14 academic year and is now teaching as an assistant professor of geography at University of Kentucky, Lexington. Dallas completed his bachelor of science at Northwest Missouri State University and is employed by the Missouri Department of Corrections. Jacki (Eckerson) Wood grew up in Maryville and graduated from Maryville High School in 1993. After attending Brigham Young University in Provo, UT, and living in Los Angeles for a few years, she decided to return home to Missouri to raise her family. She and her husband have two children and live in Lock Springs. Jacki joined the NNL in 2006, and after commuting for many years, she now works exclusively from home. In addition to writing feature stories, she also writes the occasional column, “That they might have joy.” She is also responsible for Court News, Land Transfers, Marriage Licenses and other For the Record news items. In addition, she is the social media manager for the NNL’s Facebook, Twitter, Instagram and Pinterest pages. She earned a BA in English from BYU, and after her children started school, she began taking classes at Northwest Missouri State University and received a BS in journalism. An avid sports fan, especially college football and basketball, Jacki also enjoys keeping up with her BYU Cougars and watching the Olympics. She loves laughing, snow, road trips, spending time with her family and managing their vacation home rental, Woods Crossing, near Jamesport. Contact Jacki: jackijwood@gmail.com or on twitter at @jackijwood. Dustin Henggeler has rejoined the news team at the NNL as a reporter and will also be covering sports. He was previously a member of the NNL news crew for eight years. Dustin and his wife, Miranda, have two daughters, Izzy and Madelyn. Andrea Smith has joined the copy editing team tasked with correcting spelling, grammar and facts in all articles both print and online as well as proofreading all of the advertising messages. Daughter of retired Northwest Missouri State University professor David Smith, she is a native of Maryville. She began her education career at Horace Mann and continued on at Maryville Middle School and Maryville High School. She finished by receiving a master’s of science degree in education from Northwest. In the past, she has held help positions at SeaWorld in Florida, Salisbury Zoo in Salisbury, MD, Birmingham Zoo in Birmingham, AL and Garden City Zoo in Garden City, KS. Smith returned to Maryville in 2013 and began working in a satellite office for the Missouri Department of Natural Resources. Smith lives with her three dogs she adopted from shelters Grace, Tucker and Lily. She enjoys gardening, traveling and reading mystery novels. She said she is looking forward to this new opportunity and hope she fills the job laid in front of her. “I want to do a good job and enjoy myself,” Smith said.